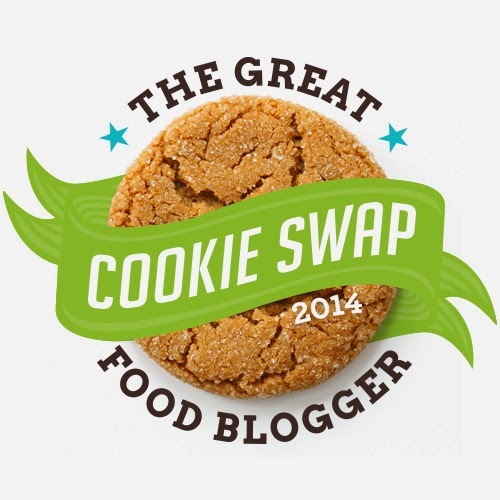 This is my first year as a participant in the 4th annual The Great Food Blogger Cookie Swap. Just around 566 food bloggers (That’s a Big Cookie Swap) from across the United States and 6 other countries participated this year. 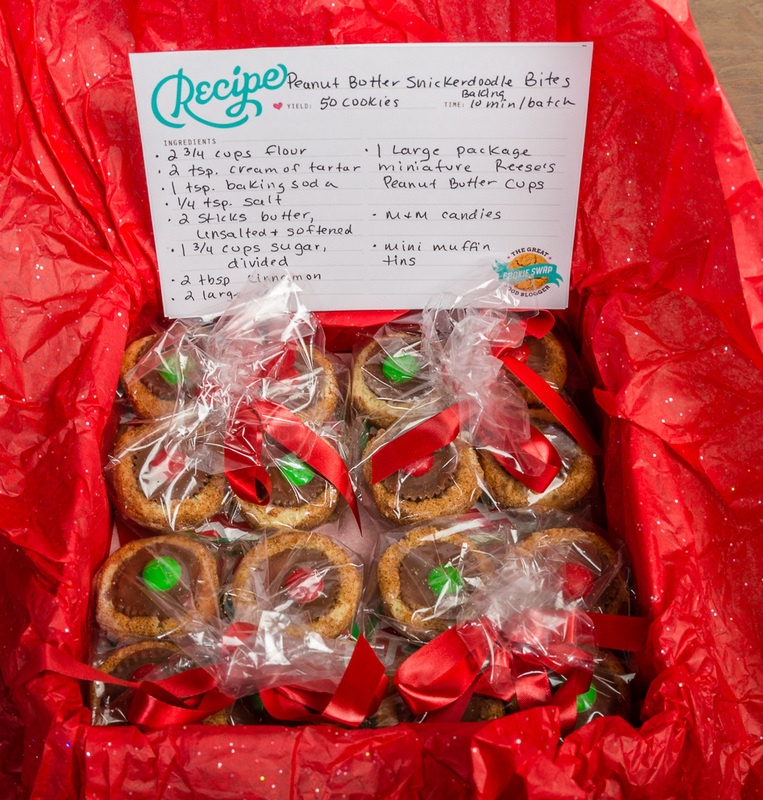 We each sent out 3 batches of our home baked cookies and received 3 batches of cookies from other bloggers in return. Not only do you get boxes of homemade cookies delivered to your door, but you also get to support Cookies for Kids’ Cancer. 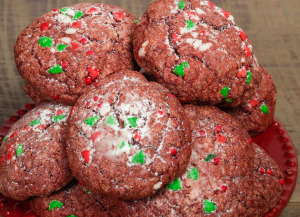 The cookie swap raised over $12,000 this year! These great sponsors matched all of our donations so a big thank you to OXO, Dixie Crystals, California Olive Ranch and Sheila G’s Brownie Brittle. OXO sent everyone who participated an 8 piece Baker’s Silicone Decorating Bottle kit. I did not use it for the cookies I made for the cookie swap but I did use it a few days ago to frost my “Gingerbread Cookie’s Gone Wild”. I also received a beautiful tin and coupon from Dixie Crystals and already the tin is filled with cookies. If you are a food blogger and would like to participate next year, be sure to sign up to be notified when things get going for 2015. I packaged 1 dozen of my Pacific Northwest Snowball cookies in cute snowman tins with a jar of my homemade marionberry jam and tayberry jam and sent to 3 bloggers. That Dang Cook from Lewistown, Pennsylvania, Jordan’s Onion from Texas (Congratulations on the new baby) and Mamal Diane Keeping Life Simple from Dayton, Ohio. All three have created some great blogs with interesting recipes, you should check them out! The first batch I received was from Lisa at Blogghetti. 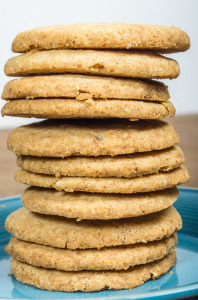 She sent Peanut Butter Snickledoodle Bits. They were packaged up so cute in a cookie tin. The smell of the peanut butter and cinnamon as I opened the box were just mouth watering. The next batch I received was from Lynne at Hearts in my Oven. She sent yummy Red Velvet Butter cookies sprinkled with jimmies – so fun! My third and last batch was from Sara at Confectionary Tales. 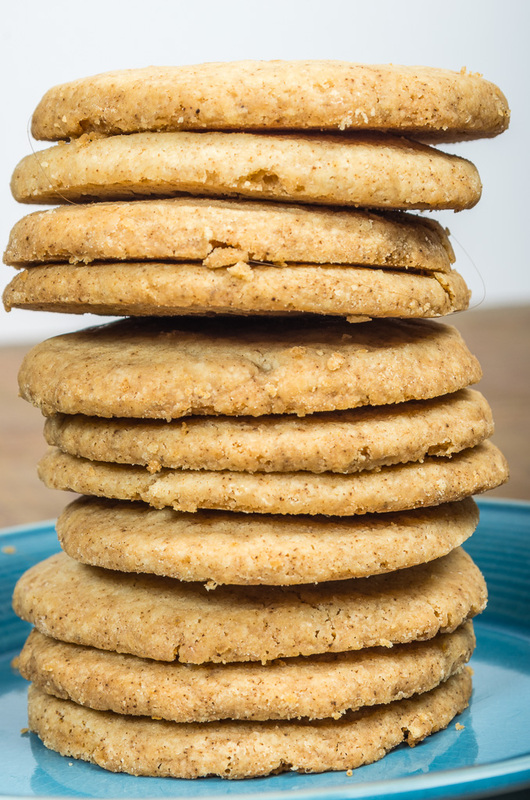 Her melt in you mouth Brown Butter Shortbread cookies were amazing! Preheat oven to 400 degrees. Mix butter, sugar and vanilla in a mixer. In small bowl combine flour and salt and add the the butter mixture until just combined, mix in hazelnuts. 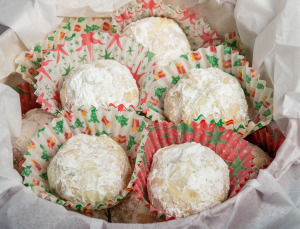 Roll dough into 1-inch balls and use a sharp knife and cut in half. With your thumb make an indentation in each half. 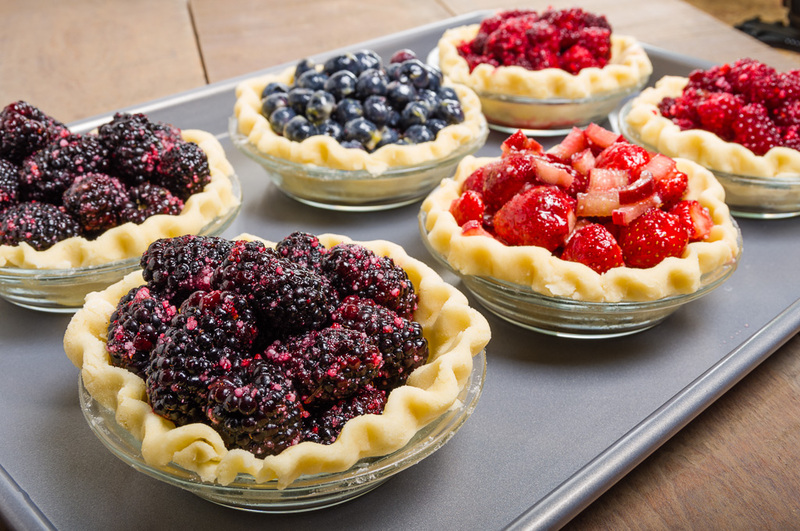 Fill with about 1/2 teaspoon of marionberry or tayberry jam. Press the two halves back together and press around the seam to seal. Gently roll back into a ball. Chill balls for about 30 minutes. Bake 10-12 minutes or until golden brown. 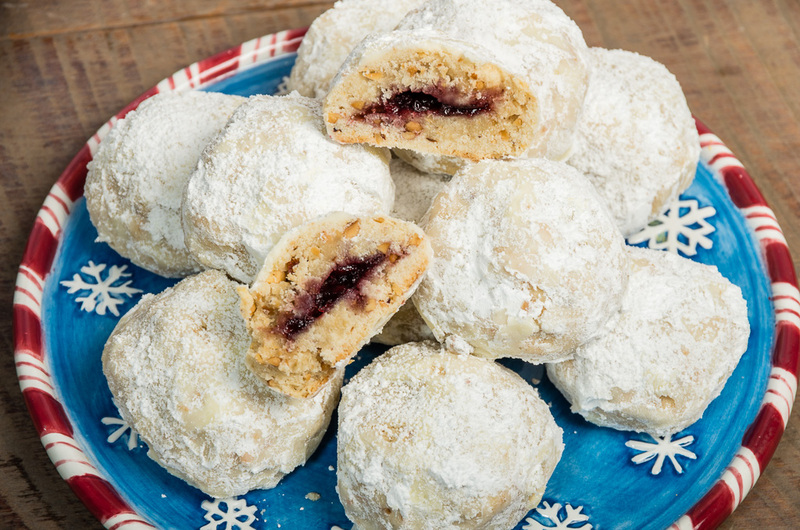 While still warm, roll in confectioners sugar and place on wire rack to cool. Roll again in confectioners sugar after they have cooled.